Brahms, Johannes, 1833-1897. Sonatas, pianos (2), op. 34b, F minor . Sonata for 2 pianos in F minor, op. 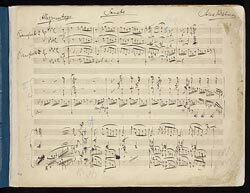 34b : autograph manuscript, 1864?